I’m about done with this gardening thing, it’s just so much work! The deck awaits. Cool drinks, evening sunsets, it all sounds so much better than slaving away in the garden. We have yet to hit our traditional summertime combo of brutally high temperatures and endless rainless weeks, and for once it seems our climate has decided to make it easy on the garden and gardener. The garden has been enjoying excellent growing weather and perfect transplanting conditions, and I think I’ve done more this year than ever to shape up the yard. The deck has been no exception. 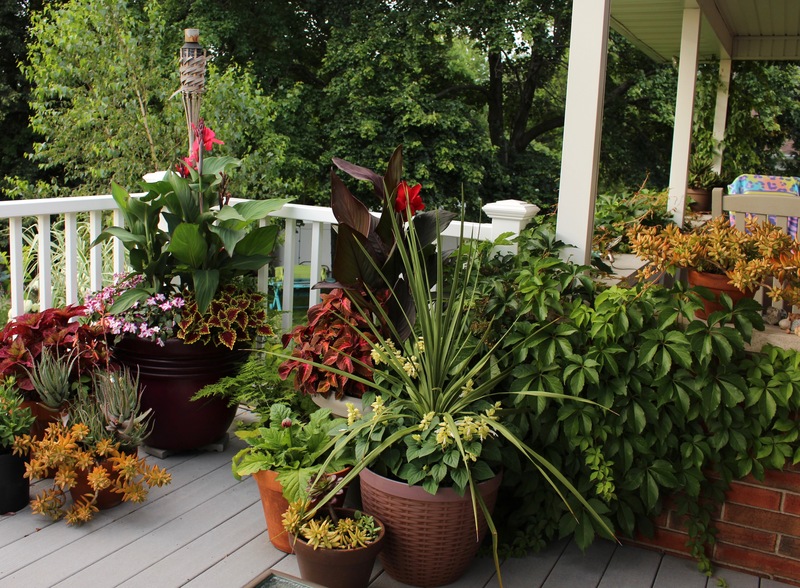 Overwintered tropicals came out of their garage storage earlier than ever and containers were put together way before the usual Memorial Day rush. I like the way it came out this year (which was not the case last summer). My biggest splurge this year, a blue sky vine (Thunbergia grandiflora) which I snapped up the minute I saw it. I was hoping it would take over this whole corner of the deck but for now it’s more intent on sending out more and more of its beautiful flowers. At least the self-sown petunias on the left make a nice color compliment. In my opinion the whole point of annuals is you can try something completely different each year, enjoy an entire season of noncommittal color, and then count on winter to completely clean the slate for next season. For the most part I started with a clean slate, but this year I tried to bring in a few new things rather than just sit in the rut I felt like I’d been settling in to. 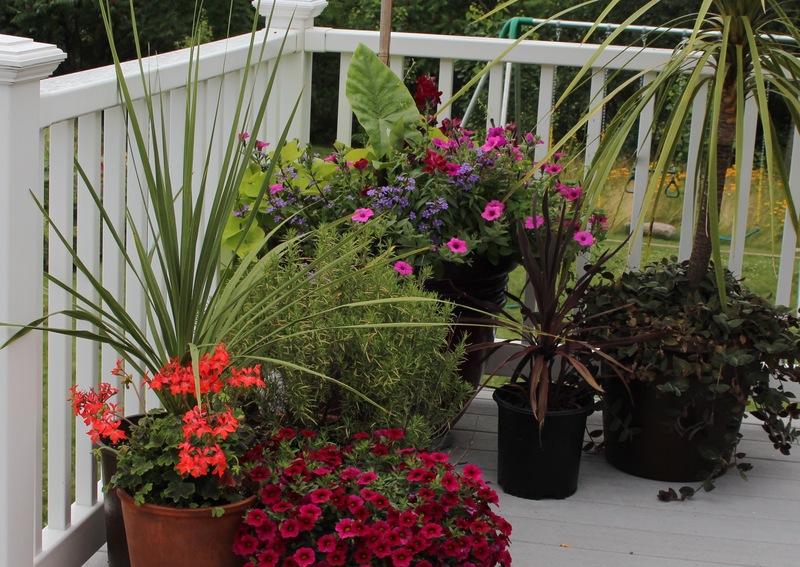 Calibrachoas will always earn a spot in the deck containers because of their unending bloom. As long as the tobacco budworms hold off on their late season attack and I get a little fertilizer on them, they’ll keep going like this for weeks! My ‘ outside the box’ move didn’t last much longer than putting down the traditional purple fountain grasses and substituting with a couple new coleus. Lots more foliage this year rather than flowers, but for the most part, since I overwinter so many plants, I’m bound to always be stuck in at least some part of the box. 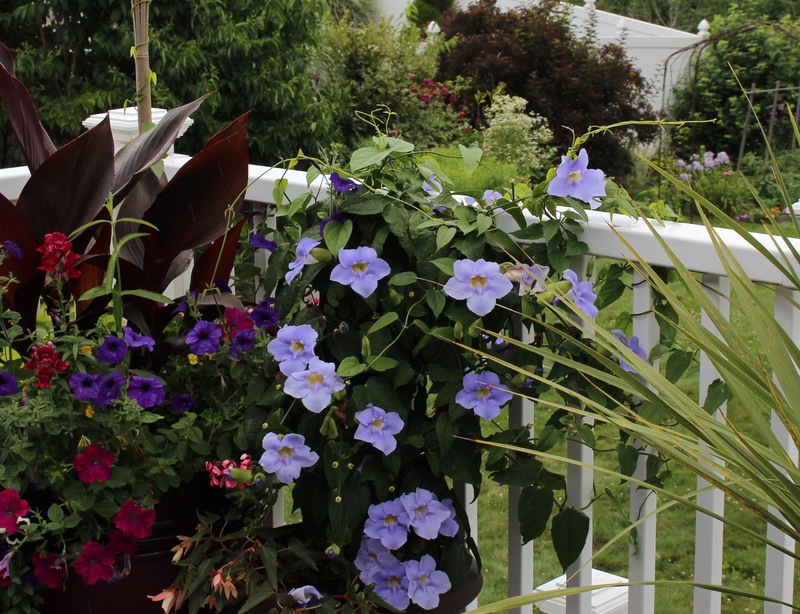 If there was a color theme this year it was orange and purple… sort of… I’m never much good at sticking to a theme, plus I’m always far too easy on the self-sown annuals which show up, such as the pink petunias and red snapdragons in the back. The far corner of the deck. The cannas are just starting, coleus are already too big, the Virginia creeper is creeping over from the other wall, and who would have thought I’d like white salvia? Since May the plan has been to re-do some of the unfinished ends of the deck. You know how the goes. As of July 11th there’s been no action, which isn’t world ending, but it does mean I haven’t yet hooked up the drip lines which should go to each planted container. The regular rains have been my savior but as things grow that won’t last. I need to get things going! By all estimates I have about another week left in me before I throw in the towel on whatever projects didn’t get done this year. All work and no play is making me an extremely dull gardener and summer is too short for dullness. 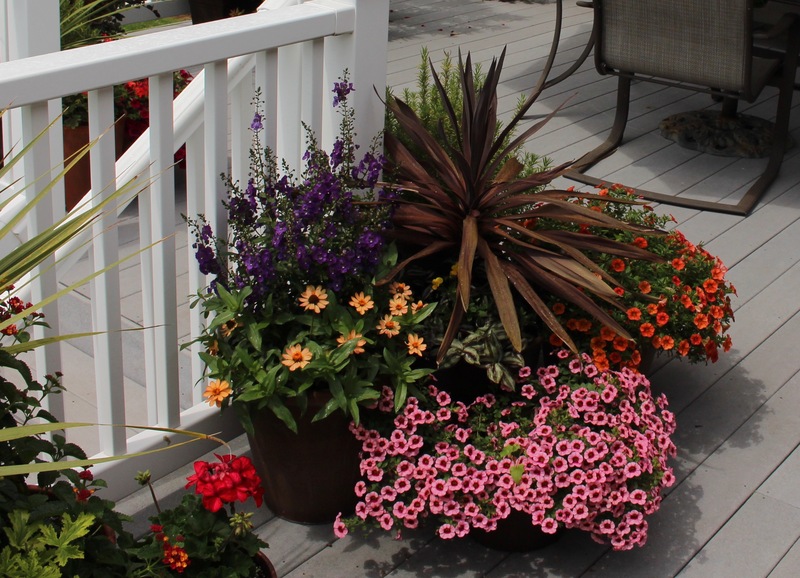 This entry was posted in annuals, deck plantings, early summer, garden design, Uncategorized and tagged deck plantings, flowers, garden, growing in containers. 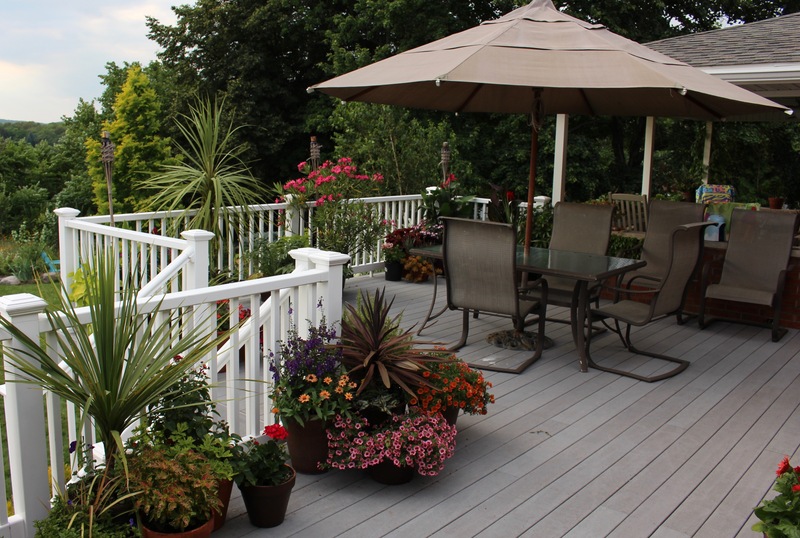 Your deck looks fabulous with all those happy plants. i’ve only watered-in new plants once or twice this season so far. Rain keeps arriving on schedule. Don’t you love it when that happens! Love the look of thse bouncy deck chairs. Isn’t it great having rain come at just the right time!? I was looking at some pictures of the garden from last year, and to see the lawn so dry and brown it bordered on grey was very depressing. But I guess it’s the lows which remind us of how lucky we are to have the highs! You do have a golden touch, Frank. Everything looks lush and healthy. I agree that the rain this year has been a blessing over last year. What fertilizer do you use? Do you use a slow release? The Thunbergia is lovely. A native of India, when I last visited Jamaica I saw it has colonized the wilds there. It covers neglected houses and hangs like curtains from the trees. Beautiful, but certainly invasive. I guess there is nowhere on the planet where humans haven’t done this. There is no longer a place where natives rule. Did you ever read ‘The New Wild’ by Fred Pearce? He has a realistic outlook on invasive species. I enjoyed it as it helped me feel less anxious! This year is the first I’ve used Osmacote and I think it’s making a huge difference. The price made me hesitate, but after finding it on clearance last fall I thought it was worth a try and it seems to be doing great. I’m such a haphazard fertilizer, and for my container plantings they really need the extra food. I can imagine the thunbergia being invasive in warmer climes. There are so many invasives which run rampant in the south and I agree it can be depressing to think of it. I haven’t read ‘The New Wild’ but it sounds interesting. I think the idea is that introduced species add to diversity? I like the idea, but lately as I look around all I see are hillsides of pears, mountainsides of gypsy moth defoliated trees, hemlock skeletons, dead ash trees… With the exception of red maples the tree canopy in much of this area looks more like a moth eaten blanket than an evolving ecosystem. Your deck looks fabulous Frank! So many gorgeous containers with lots of lovely foliage too. I would love to try growing Coleus, but just don’t have enough shady spots. The blue vine is really pretty as well. My containers are looking tired already… too much heat and wind constantly drying them out. Keeping up with the watering is usually no problem until August. Maybe I need one of those drip systems too. I envy you your perfect weather so far! The drip system is awesome! I couldn’t manage containers without it and it was actually much easier and cheaper than I thought. I have been very pleased with the newer sun-tolerant coleus which can be found around here. 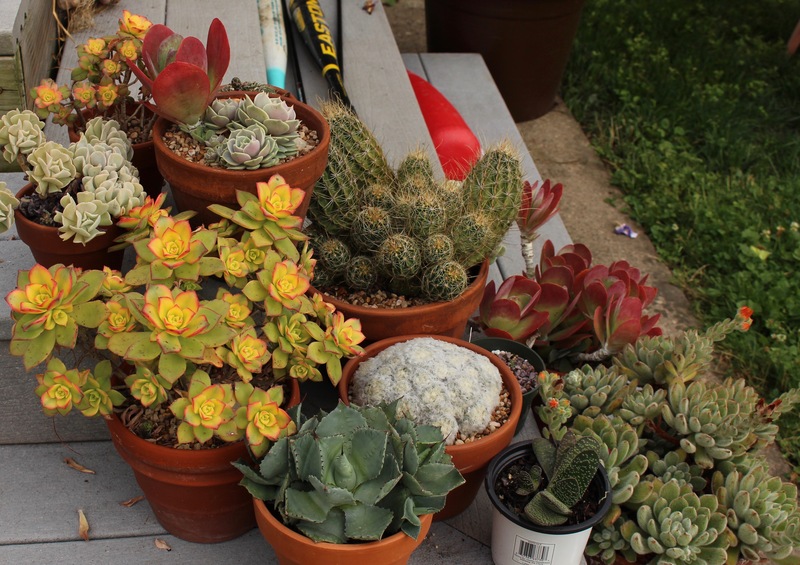 they’re more expensive (as always) and cutting propagated rather than seed grown, but they hold up to heat, sun, and drought much better than some of the older strains, and do equally well in flower beds versus containers. Frank, what a great setting to enjoy a beverage or a meal or just some good conversation! Your colors and textures blend beautifully and your tropical theme is eye-catching. I plan to follow suit soon with my own ‘Deck Days’ post… cool, where yours is warm. I’m looking forward to seeing your plantings! I usually don’t do cool colors since they seem to disappear in our heat and bright light, but there are always plenty of ‘off-message’ plantings which find their way in each year, and the variety always keeps it fun. The deck looks marvelous. Love the Blue Sky Vine! Your hard work shows; everything looks gorgeous, happy, and healthy. You do, indeed, deserve a new cactus! Looks like an awesome place to spend time 🙂 Love it !